A James Bond themed ‘Skyball’ raised a four-figure sum to support Manchester’s homeless community. 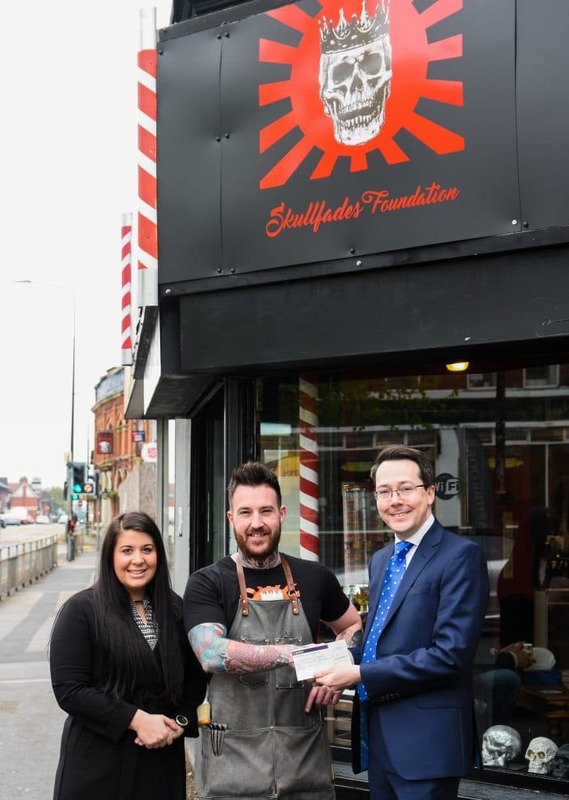 The Trafford Law Society event saw lawyers from across South Manchester donate £1,200 to support the work of the Skullfades Foundation, a charity established by Sale-based barber Ged King to provide free haircuts to local people who find themselves homeless. The foundation also provides a range of practical help and support, including a winter appeal to give Manchester’s homeless community more appropriate clothing and sleeping bags for the colder months. “The great work Ged and his team are doing to improve lives on a small budget really struck a chord with our members. We hope the money raised will help them to continue to support Manchester’s homeless community. The cheque was presented to Ged King by law society committee members Phillip Rhodes and Camilla Burton-Baddeley from Slater Heelis LLP. Trafford Law Society is a local law society, providing information, seminars and social events for its members.